St Cyprian’s Church, Glentworth Street, London NW1, Saturday 11 November 2000. For Dmitri Dmitryevich Shostakovich the year 1963 was one of relative compositional inactivity. The previous year had seen perhaps his most overtly dissident work, the Thirteenth Symphony (`Babi Yar’), premiered, and the resurrection of his infamous opera Lady Macbeth of the Mtsensk District under the new title Katerina Ismailova. The Fourth Symphony (composed in 1935-36), another work whose fate was directly affected by the scathing 1936 article in Pravda `Muddle instead of Music’, had been premiered a year earlier in 1961. Together with the composer’s marriage to his third wife, Irina Supinskaya, in December 1962, 1963 may well have been embarked upon with a feeling of rejuvenation and hope. Yet, apart from the re- orchestration of the Schumann Cello Concerto for Mstislav Rostropovich and the orchestration of his song cycle of 1948, From Jewish Folk Poetry, Shostakovich’s only original composition of that year was the Overture on Russian and Kirghiz Folk Themes. On a recent visit to the Kirghiz Soviet Socialist Republic to commemorate the centenary of the republic’s `voluntary incorporation into Russia’, Shostakovich had promised to write a work to celebrate the occasion. During his visit the composer witnessed at first hand the artistry of at least one of Kirghizstan’s distinguished folk musicians, and later recalled that the Kirghiz S.S.R. was a place `where everyone sings’. The experience of the folk music tradition of Kirghizstan appears to have inspired Shostakovich to employ Kirghiz folk melodies in this overture. That he also used a Russian theme perhaps represents, musically, Kirghistan’s integration with Russia. Despite his personal interaction with Kirghiz folk musicians, Shostakovich was no ethnomusicologist and took both the Russian and Kirghiz themes from published collections; the main Russian theme had been recently collected from the Omsk region of Siberia. The overture was completed in early October 1963 and received its premiere in the Frunze Theatre of Opera and Ballet (Frunze was the capital of Kirghiz SSR) on 2nd November. The Moscow premiere followed eight days later. Shostakovich’s Seventh Symphony, the Leningrad, penned amidst the Nazi siege of Leningrad in 1941, was an instant hit with Soviets and the other Allied countries. Conductors such as Toscanini and Henry Wood propagated the work internationally and the composer’s image (decorated with a fireman’s helmet) made the front cover of Time magazine on 20th July 1942. Shostakovich became a national and international hero, generating great expectations for the next symphony. 2nd February 1943 saw the eventual defeat of the German army at Stalingrad and signalled a major turning point in the war. Despite the gigantic losses suffered by the Red Army during the battle a sense of great achievement and pride spread across the Soviet Union – Stalin had defeated the Nazis. It was amidst this atmosphere that Shostakovich began his Eighth Symphony. This symphony, one of the largest works of the composer’s entire output, was written in only two months. The piano sketches for the work appear to have been written in just one day – 7th July 1943 – with Shostakovich remarkably finding time to jot down a melody to enter in the competition for a new USSR national anthem. This competition took up a substantial amount of the composer’s time; he collaborated with Khachaturian on an anthem (Song of the Red Army) and also, as a member of the judging panel, was forced to listen to every entry a number of times and in a number of different arrangements. Yet despite these interruptions the first movement of the new symphony was completed by 1st August 1943. A few days later Shostakovich took his family to the recently established Composer’s Retreat at Ivanovo, northeast of Moscow. Here he continued work on the symphony – interrupted only by the mandatory 5 o’clock game of volleyball with the other composers at the retreat. By 5th September 1943 the entire score was complete. At this time the principal conductor of the Leningrad Philharmonic Orchestra, Yevgeni Mravinsky, visited Shostakovich. The composer showed Mravinsky the score of the Eighth Symphony and the conductor resolved to perform it immediately. The work was premiered in Moscow on 4th November 1943 and, perhaps partly because of the eagerness of the conductor to perform the work, is dedicated to Yevgeni Alexandrovich Mravinsky. The work was received with indifference by the public and a growing sense of outrage by the critics. (The Eighth Symphony was later to be used against the composer in the 1948 Zhdanov decree, the second time that Shostakovich and his music were held up to public criticism and ridicule). The successor to Shostakovich’s Seventh Symphony was expected to be the second instalment of a symphonic war trilogy, and thus the sense of bleakness that pervades the work was incomprehensible, especially when `the People’ were deemed to require only uplifting and celebratory music. 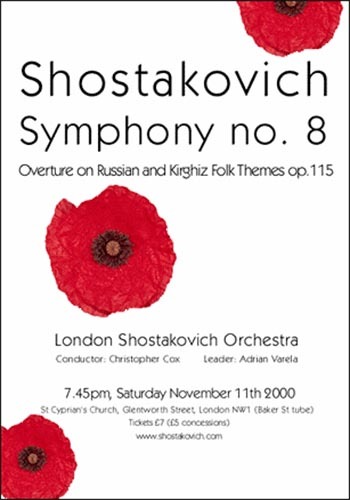 However, due to the international success of the Leningrad Symphony the cultural apparatchiks were unable to openly criticise Shostakovich, and therefore they propagated the notion that the Eighth Symphony was a memorial to the Soviet victims of the Battle of Stalingrad, adopting, in the Soviet Union at least, the tag `Stalingrad Symphony’. The symphony’s tepid reception meant that it was soon dropped from the concert repertoire both at home and abroad, having to wait, as with a number of other controversial works, until the 1960s for its revival. The symphony is one of Shostakovich’s symphonic masterpieces. Cast in an unconventional five-movement form, the influence of Mahler is particularly evident in thematic processes. In the key of C minor this symphony joins a legacy of famous C minor symphonies from Beethoven’s Fifth to Bruckner’s Eighth and Mahler’s Second (Resurrection), all with the general plot archetype of `tragedy to triumph’. The work opens with an extended adagio section, which seems out of balance with the brutally truncated allegro that follows. This allegro reaches a climax with deafening percussion crescendi that eventually gives way to an extended cor anglais monody – perhaps the hero of the `tragedy to triumph’ plot identifying himself. Shostakovich, infamously reticent when questioned about his music, described the second movement, in a published interview at the time of the symphony’s premiere, as `a march with elements of a scherzo’. The third movement – written in just one week – opens with an agitated solo for the viola section which sets the precedent for the entire movement, whose inexorable motor-rhythm comes to rest only with the advent of the fourth movement, a slow moving and pensive passacaglia. The opening theme of the final movement is presented by a solo bassoon, reawakening the `hero’ last encountered in the first movement. This movement contains solos for other instruments also (including violin and ‘cello), and concludes with a subdued flute in the lower reaches of its register. Far from celebratory, the conclusion of this symphony with the solo flute suggests that perhaps the lone `hero’ has not triumphed but merely survived.